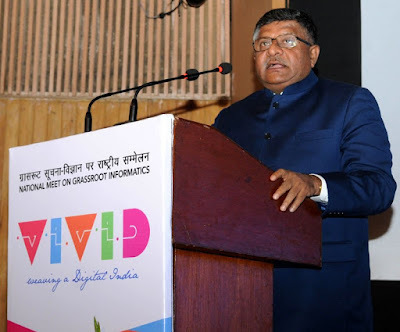 The National Informatics Centre (NIC) has organized a three-day National Meet on Grassroot Informatics- ‘VIVID 2018’ at the India Habitat Centre, New Delhi. The three-day event was inaugurated by the Union Minister of Electronics & Information Technology and Law & Justice, Ravi Shankar Prasad. The aim of the meet is to showcase the various initiatives of NIC in creating and enhancing the security of Digital Infrastructure in the country. VIVID 2018 would be an extensive platform for knowledge sharing which would empower 240 NIC district officials from across the country to interact and leverage each other’s experience and best practices. During this three days event, DIOs gave presentations on their portals, showcasing their applications, their District initiatives and their immense contribution towards the implementation of the Digital India initiative of the Government. This National Conference was significant as the use of cloud services continues to accelerate, it would lead to an exponentially increasing number of potential targets. Not only this, the Internet of Things (IoT) is expected to increase the attack surface. NIC provides a multi-layered security framework for the protection of applications hosted in the Data Centres and related mobile apps as well as NIC infrastructure. NIC-CERT is a setup of NIC which will upscale the existing security infrastructure to prevent the rising number of cyber-attacks. Its main objective is to create a comprehensive framework that would integrate world-class security components and inbuilt threat intelligence for detection, prevention and incident response. National Informatics Centre (NIC) was established in 1976. Since then it has emerged as a "prime builder" of e-Government / e-Governance applications up to the grassroots level as well as a promoter of digital opportunities for sustainable development. It is the premier science & technology organization of Government of India in informatics services and information and communication technology (ICT) applications. NIC is a part of the Indian Ministry of Electronics and Information Technology's Department of Electronics & Information Technology and has its headquarters in New Delhi. NIC, through its ICT Network, "NICNET", has institutional linkages with all the Ministries or Departments of the Central Government, 36 State Governments/ Union Territories, and about 708 District administrations of India. NIC has been instrumental in steering e-Government/e-Governance applications in government ministries/departments at the Centre, States, Districts and Blocks, facilitating improvement in government services, wider transparency, promoting decentralized planning and management, resulting in better efficiency and accountability to the people of India. At present, Neeta Verma is the Director General of NIC.